WACO, Texas -- Pilgrim's Pride has ordered a massive recall of cooked chicken products after consumers and federal meat inspectors found contamination by such foreign material as wood, plastic, rubber and metal. The recall of more than 4.5 million pounds of fully cooked chicken products announced Tuesday is an expansion of a recall of almost 41,000 pounds of cooked chicken nugget products announced April 7. Stores sold the items under the Gold Kist Farms, Pierce and Sweet Georgia brands. A statement from the U.S. Food Safety and Inspection Service of the U.S. Department of Agriculture says the recall involves products bearing the establishment number "EST.20728" inside the USDA inspection mark. The items were shipped nationwide for institutional use, and records from the Waco, Texas-based company show schools purchased the products through Pilgrim's Pride commercial channels. No confirmed reports of adverse reactions from consumption of the products have been reported. The chicken products were produced on various dates between Aug. 21, 2014, to March 1, 2016. Customers are advised to throw out any of the recalled food out or return it to where it was purchased. 30-lb boxes containing 5-lb clear bags of "6116 Gold Kist Farms Fully Cooked Whole Grain Breaded Chicken Nuggets Nugget Shaped Chicken Patties" with use by/sell by dates of 10/23/2016 and 03/01/2017, and packaging dates of 10/23/2015 and 03/01/2016. 20-lb boxes containing 5-lb clear bags of "6145 Gold Kist Farms Menu Right Fully Cooked Whole Grain Breaded Chicken Nuggets Breaded Nugget Shaped Chicken Patties" with use by/sell by dates of 05/28/2016, and 04/27/2016 and packaging dates of 05/28/2015 and 04/27/2015. 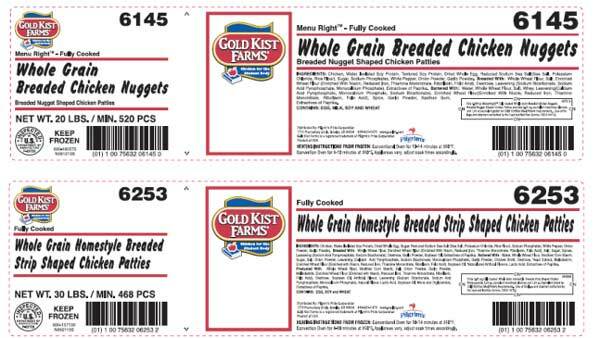 30-lb boxes containing 5-lb clear bags of "6253 Gold Kist Farms Fully Cooked Whole Grain Homestyle Breaded Strip Shaped Chicken Patties" with use by/sell by dates of 04/27/2016 and 08/06/2016, and packaging dates of 04/27/2015 and 08/06/2015. 30-lb boxes containing 5-lb clear bags of "6353 Gold Kist Farms Fully Cooked Whole Grain Homestyle Breaded Breakfast Chicken Patties" with use/by sell by dates of 09/17/2016 and 09/21/2016 and packaging dates 09/17/2015 and 09/21/2015. 30-lb boxes containing 5-lb clear bags of "6654 Gold Kist Farms Fully Cooked Whole Grain Homestyle Breaded Chicken Patty" with use by/sell by dates of 05/11/2016, 06/05/2016, and 08/21/2015, and packaging dates of 05/11/2015, 06/05/2015, and 08/21/2014. 30-lb boxes containing 5-lb clear bags of "66660 Gold Kist Farms Fully Cooked Whole Grain Hot & Spicy Breaded Chicken Patty" with use by/sell by date of 07/18/2016 and packaging date of 07/18/2015. 20-lb boxes containing 5-lb clear bags of "69160 Gold Kist Farms Fully Cooked Whole Grain Popcorn Style Chicken Patty Fritters" with use/by sell by dates of 08/19/2016 and 09/25/2016, and packaging dates of 8/19/2015 and 09/25/2015. 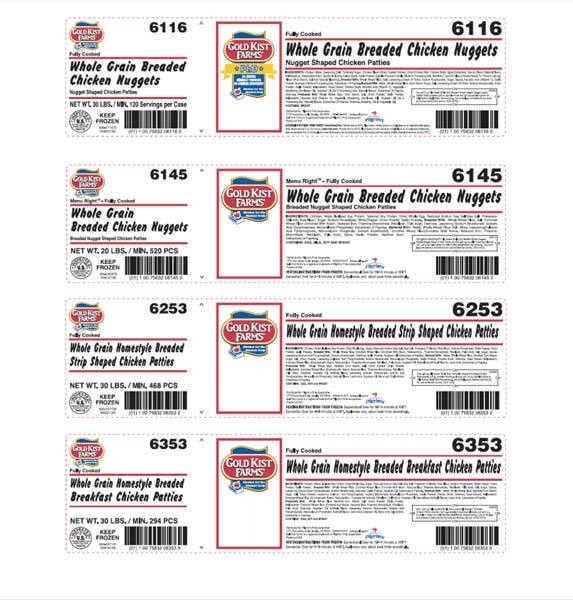 10-lb boxes containing 5-lb clear bags of "70340 Pierce Chicken Fully Cooked Breaded Chicken Tenderloins" with a use by/sell by dates of 09/28/2016, 09/25/2016, and 11/09/2016, and packaging dates of 09/28/2015, 09/25/2015, and 11/09/2015. 30-lb boxes containing of 5-lb clear bags of "612100 Gold Kist Farms Fully Cooked Whole Grain Breaded Chicken Nuggets Nugget Shaped Chicken Patties" with use by/sell by dates of 07/11/2016, 11/09/2016, and 11/25/2016 and packaging dates of 07/11/2015, 11/09/2015, and 11/25/2015. 30-lb boxes containing 5-lb clear bags of "615300 Gold Kist Farms Fully Cooked Whole Grain Home-style Breaded Chicken Nuggets Nugget Shaped Chicken Patties" with use by/ sell by dates of 10/08/2016, 10/09/2016, 10/03/2016, 10/20/2016, 11/24/2016, 10/01/2016, 10/16/2016, 10/14/2016, and packaging dates of 10/08/2015, 10/01/2015, 10/16/2015, 10/09/2015, 10/03/2015, 10/20/2015, 11/24/2015, and 10/14/2015. 30-lb boxes containing 5-lb clear bags of "625300 Gold Kist Farms Fully Cooked Whole Grain Home-style Breaded Chicken Strip Shaped Chicken Patties" with a use by/sell by date of 10/16/2016, and a packaging date of 10/16/2015. 20-lb boxes containing 5-lb clear bags of "633100 Gold Kist Farms Fully Cooked Whole Grain Home-style Breaded Breakfast Chicken Breast Patties with Rib Meat" with a use by/sell by date of 10/03/2016, and a packaging date of 10/03/2015. 30-lb boxes containing 5-lb clear bags of "662100 Gold Kist Farms Fully Cooked Whole Grain Breaded Chicken Patties" with use by/sell by dates of 10/07/2016 and 08/13/2016, and packaging dates of 10/07/2015 and 08/13/2015. 30-lb boxes containing 5-lb clear bags of "665400 Gold Kist Farms Fully Cooked Whole Grain Home-style Breaded Chicken Patties" with use by/sell by dates of 10/06/2016, 07/24/2016, 07/01/2016, 07/25/2016, 08/29/2016, 09/12/2016, 12/02/2016, 12/21/2016, and packaging dates of 10/06/2015, 07/24/2015, 07/01/2015, 07/25/2015, 08/29/2016, 09/12/2016, 12/02/2016, 12/21/2016. 30-lb boxes containing of 5-lb clear bags of "666600 Gold Kist Farms Fully Cooked Whole Grain Hot & Spicy Breaded Chicken Patties" with use by/sell by dates of 10/08/2016, 09/29/2015, 09/30/2016, and packaging dates of 10/08/2015, 09/29/2015, 09/30/2015. 10-lb boxes containing 5-lb clear bags of "92105 Sweet Georgia Brand FULLY COOKED WHOLE GRAIN BREADED CHICKEN BREAST NUGGETS BREADED NUGGET SHAPED CHICKEN PATTIES WITH RIB MEAT" with a use/by sell by date of 05/28/2016, and a packaging date of 05/28/2015. 10-lb boxes containing 5-lb clear bags of "92430 Sweet Georgia Brand FULLY COOKED BREADED CHICKEN TENDERLOINS" with use by/sell by dates of 09/28/2016, 11/09/2016, and packaging dates of 09/28/2016, 11/09/2016. 10-lb boxes containing 5-lb clear bags of "93406 Sweet Georgia Brand FULLY COOKED WHOLE GRAIN POPCORN STYLE CHICKEN PATTY FRITTERS" with a use by/sell by date of 05/28/2016 and a packaging date of 05/28/2015. 10-lb boxes containing 5-lb clear bags of "94208 Sweet Georgia Brand FULLY COOKED WHOLE GRAIN HOT AND SPICY BREADED CHICKEN PATTY" with a use by date of 07/18/2016 and a packaging date of 07/18/2015. 10-lb boxes containing 5-lb clear bags of "96965 Sweet Georgia Brand FULLY COOKED WHOLE GRAIN BREADED CHICKEN NUGGETS NUGGET SHAPED CHICKEN PATTIES" with a use by/sell by date of 10/14/2016 and a packaging date of 10/14/2015. 10-lb boxes containing 5-lb clear bags of "96971 Sweet Georgia Brand FULLY COOKED WHOLE GRAIN BREADED CHICKEN BREAST PATTIES WITH RIB MEAT" with a use by/sell by date of 10/08/2016 and a packaging date of 10/08/2015. 10-lb boxes containing 5-lb clear bags of "96973 Sweet Georgia Brand FULLY COOKED WHOLE GRAIN BREADED CHICKEN PATTIES" with use by/sell by dates of 07/24/2016, 07/01/2016, 12/02/2016, 09/12/2016, and packaging dates of 07/24/2015, 07/01/2015, 12/02/2015, 09/12/2015. 10-lb boxes containing 5-lb clear bags of "96978 Sweet Georgia Brand FULLY COOKED WHOLE GRAIN HOT AND SPICY BREADED CHICKEN PATTIES" with use by/sell by dates of 10/08/2016 and 9/30/2016, and packaging dates of 10/08/2015 and 9/30/2016.